Home Biafra IPOB Referendum Biafra: The Proposed Biafra Referendum, The Nigerian Christian Community And The Global Ecclesia. Biafra: The Proposed Biafra Referendum, The Nigerian Christian Community And The Global Ecclesia. In the first epistle of St. Paul to the apostles and brethren in Corinth, he spoke thus "Now I beseech you, brethren, by the name of our Lord Jesus Christ, that ye all speak the same thing, and that there be no divisions among you; but that ye be perfectly joined together in the same mind and in the same judgement - 1Corinthians 1v10 - King James version. The World is fast tearing apart and all people of like understanding are exploring avenues for mutual survival. The entire Muslim faithful Worldwide have a running strategy roadmap for their overall survival and by extension, plans to overtake Christians in global religious leaders. This same have they spoiled about over time without equivocation at the expense of the Christian world. I doubt if the Christian world has any survival plans at all. The unchallenged stretches of Christian persecutions and unprovoked killings across the globe and Nigeria in particular and Biafrans especially and the mass exodus of Christians into other detestful fate, leave me and a million others with No option but ask to be edified as concerned brothers in faith, does the global Christian world have any survival plans for the Christian communities worldwide? The persecution in Nigeria has a global cognition for being the largest spot of Christian deaths world over, without an iota of help from the global Christian community. The ridicule this obvious global Christian helplessness is creating against the Christian faith, especially among existing Christians is so much unprecedented, ridiculous and unexpected! The Holy Bible says and I quote, "Let everyone do that which he is good at". The Muslim world has shown from all indications that they are good in killing, mayhem and massive unprovoked destruction and destabilization. This they have championed with pride and unhidden readiness to accentuate without qualms. The Nigerian Christian community has paid very dearly for its nonchalant idiosyncrasies towards preservation and survival. The lack of the much-needed spirit of ecumenicalism among various denominations of the Nigerian Christian community has remained a major plaque drifting Christianity in Nigeria into an extirpable oblivion if nothing is done with needed exigencies for immediate exculpation into safety. If the many historical pieces of evidence that abound about the state of Turkey, Egypt and various other formally Christian Nations, that are now completely Muslim states, of course, through the instrumentality of the Islamic Jihad and coercion do not serve any lesson to the Christian community across Nigeria for urgent reawakening, and the various brutal religious crises in Nigeria, which left unforgettable grief and pain, from Plateau to Kaduna, from Benue to Taraba, from Kano to Niger state, from Zamfara to Nasarawa, from Adamawa to Borno state, and from Bauchi to Yobe, Enugu to Anambra, Ebonyi to Abia, IMO to Delta state, Bayelsa to Cross-river states, And Edo state to Rivers state, I will be left with No other option than to seek Asylum elsewhere, with the believe that the fate of the Nigerian Christian community is sealed. The rate of the irresponsibility of the Christian community, especially as it comes from the CAN(the umbrella body of Nigerian Christians), is way too ridiculous, in lieu of the many persecutions before her very eyes. The urgency of the need for survival must be treated with all earnest, except the Nigerian Christian community has given it up already on the continuation of Christianity in Nigeria. The current spate of Christian killings in Nigeria by the combined strength and manpower of the state-sponsored Fulani terrorists and Bokoharam terrorist group and their open coercion for land-grabbing, through various government, sponsored bills, are as a matter of fact not accidental but a deliberately orchestrated ancient conspiracy, to extend the Fulani domineering hunger, deep into the Atlantic Ocean. Everyone is a soft target so long as the Fulani Islamic campaign for total occupation and take-over is still on course. The depth of animosity from the Fulani over anything Christian is a huge call for urgent concern. Open door USA, A nongovernmental and academic research centre/organization based in the United States of America, which specializes in monitoring Worldwide demographic trends in Christianity has enormous facts concerning Christian deaths in Nigeria, but No action has emanated from the Nigerian Christian community to press for a Worldwide Christian Aid in the bid for self-defense. Only death, however, has yet to yield to any solution in this cosmos, more reasons we must do anything to fight for the survival of Christianity Worldwide. A man has for decades evolved principles for solving enormous obstacles since creation, of course through the help of God Almighty. 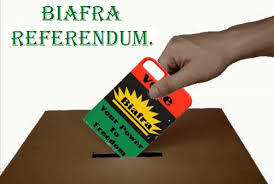 The forthcoming Biafra referendum stands as the only and by extension, the last standing alternative help for the Nigerian Christian community. The attention of the global Christian communities needed to be activated over the plight of Christians anywhere, a task that No Nation is yet to rise up and take up as a challenge. Biafra populace, which constitutes the largest Christian population of Nigerians, and who have collectively shown total resistance to anything that suggests accommodation for Islamic campaign, will very assuredly, fill in the gap, and become the safest haven for Christians in the whole World. The capacity of Biafrans to resist the global campaign against her in the 1967 war of genocide, is a massive valid conviction, that when established as a sovereign state, she could deploy the needed diplomatic machinery that attracts global attention for Christians in Sub-saharan Africa and the entire Black continent at large. The various intimidations against Christians in Nigeria, whose massive valid records of the most brutal and barbaric kind of killings abound, are such a horror, never to permit to continue. The various open polemics coming from the Miyetti Allah Kautal Hore, over any successful spree of Christian massacres from the valleys of Benue state, in the middle-belt of Nigeria, the various gruesome destruction of lives and properties in the Jos plateau, the Zamfara massacres, the Taraba massacres are too horrific to keep happening. The continued hostilities against Christian abductees of the Bokoharam Islamic terrorist group, of particular interest of which is the Leah Sharibu, the Christian teenaged girl, who remains in Islamic custody because she is a Christian. What about the ongoing death trial of five Christian youths in Yobe state, simply because Fulani Islamic terrorist groups got overpowered in a clash that involved the two groups. Have any Nations in the World made efforts to come to the rescue of the defenseless Christians in those parts of the Country, Nigeria? The answer is NO. The Nigerian Christian community must rise up from her slumber and support the Biafran Referendum for the restoration of the sovereign territory of Biafra. It must become the gospel in all Christian congregations, the campaign for the restoration of Biafra must be in the front burner of all Christian discussions for safety and political solution. All moves by the Fulani led dictatorship to discourage and frustrate the ongoing moves for Biafra referendum must, as a matter of fact, be exposed by all Christians in Nigeria that aspires to hand down the Barton of continuation of Christianity to their offsprings yet unborn. The survival of Biafrans in the forthcoming Biafra referendum for independence shall serve as a launchpad to the survival of the entire Nigerian Christian community and Africa by extension. A sovereign state of Biafra shall not only fund the security of Christians in all other parts of Nigeria and the black continent in particular but shall do well to bring the issue of African Christian community to the front burner of global discourse, having had a greater share of Christian persecutions and deaths in Nigeria. Rev. Martin Luther King says and I quote "Our lives begin to end the day we become silent about things that matter" he continued " Take the first step in faith. You do not have to see the whole staircase, just take the first step" we must adherently take the first step through open support for the Biafran Independence referendum. A stitch in time saves nine. Nigerian Christian community, arise and support your brothers in faith! Let the introductory admonition from st. Paul in 1Corinthians 1v10, continue as the new understanding among the Nigerian Christian community and especially as it concerns the proposed Biafra referendum. The worldwide body of Christians makes up the ecclesia. It is a singular word, like the Christendom, that defines Christians as a people no matter the part of the world where they may be. The mammoth burden that awaits this global definition can be settled with the restoration of the sovereign state of Biafra. A roadmap for global Christian freedom against the growing insanity of religious nationalism among Muslims, the world over, can be settled with Biafra emerging as a sovereign Christian Nation. She shall stand as the only Nation in Africa untainted with Islamic infiltration. Biafrans have a shared history of global religious persecution and as such understood very well the pains Christians pass through particularly in Africa and the World at large. Biafrans have a very unique pattern of resistance against any form of Islamic campaign within the Biafran territorial communities. The center for the study of global Christianity, Open doors USA, Help for the Church in Need, the Global ecumenical movement, The World watch list, The Christian Association of Nigeria(CAN), the Pentecostal Fellowship of Nigeria(PFN), the Catholic Mission and all other pro-Christian organizations, have a duty to ensure the success of the Biafran referendum. Biafra as a sovereign state shall serve as the global mouthpiece for Christians. She shall fund the coalition of all Christian communities and proceed to enforce the security of the susceptible Christian communities worldwide. The boldness of Biafrans in speaking for vulnerable Christians in Nigeria so far shall take a global stage for the global Christians. Any refusal to support the Biafran independence referendum, which stands as the sole option for the global Christian communities, shall remain as a costly mistake among the supposed brethren in faith. Rallying around Biafrans for support in the forthcoming independence referendum shall in itself, remain a great testimony to the survival of Christians Worldwide and Africa in particular. Rev. Martin Luther King, says and I quote "The ultimate measure of a man is not where he stands in moments of comfort, but where he stands at times of challenge and controversy " Religious freedom which we earnestly yearn for is attainable in a freed Biafra republic. The birthing of Biafra shall be our success.